The rise of the New Traditionalists in the late 1980s meant that the sooth pop-country which had served Janie well earlier in the decade was sounding dated. Janie was also now over 40, as younger artists came forward, and radio abandoned her, with no really successful singles from her 1987 album After Midnight. She took on the challenge with gusto, adapting to a much more traditional country style for 1988’s Saddle The Wind, with the help of producer Steve Buckingham. She was still, incidentally, using the new spelling of Frickie, which she had adopted for Black And White. There were three singles to promote this album. Unfortunately, none did very well, but they are all excellent songs, beautifully sung and unmistakeably real country. ‘Where Does Love Go (When It’s Gone)’ is a brisk Peter Rowan song with a bright upbeat feel despite a lyric pondering the reasons for a breakup. ‘I’ll Walk Before I’ll Crawl’ is a lovely mid-paced ballad (written by Gidget Baird and Linda Buell) gives a cheating husband an ultimatum. The third and last single, ‘Heart’, was written by the ultra-successful writing team of Don Schlitz and Paul Overstreet. It is an excellent song about a woman desperately tempted to cheat on her husband. Janie’s intense vocal is superlative on this song. Several other classic covers are also included. Willie Nelson’s ballad The Healing Hands Of Time’ is another true classic song given an exquisite vocal, with some tasteful steel and piano. The album opens with a sprightly version of the Western Swing ‘Sugar Moon’ which is delightful, and Janie also revives the up-tempo ‘Crazy Dreams’, one of Patsy Cline’s lesser known early recordings. ‘I’m Not That Good At Goodbye’, a much recorded song written by Bob McDill and Don Williams, has another excellent vocal from Janie. ‘If I Were Only Her Tonight’, written by McDill with Bucky Jones and Dickey Lee, is another fine song about unrequited love and the pull of an old flame. There is a Marty Robbins Mexican flavor to the title track, with Spanish guitar accompanying a story song written by the album’s producer Buckingham, about a star-crossed border romance with a bandido. Janie had a truly lovely voice, but at her commercial peak she was too often buried under poppy production. In this album she finally married her voice to great production and songs, making this by far her best work. I would recommend it to anyone. Tammy Wynette spent the better part of the late 1970s and 1980s seeing her commercial fortunes begin to wane. Actress Annette O’Toole portrayed Wynette in a television movie, Stand By Your Man, in May 1981. Her singles were routinely charting top twenty during this time and she returned to the top ten when her cover of Dan Hill’s “Sometimes When We Touch,” a duet with Mark Grey, peaked at #6 in 1985. Our coverage resumes in 1987, which found mainstream country deep in the throngs of a traditional renaissance. Wynette followed suit accordingly with Higher Ground, her twenty-eighth album, produced by Steve Buckingham. While any momentum she may’ve gained from her previous album had cooled, it didn’t stop Epic from pushing ahead with three singles from the set. The dobro drenched “Your Love,” a mid-tempo ballad featuring Ricky Skaggs hit #12. The neo-traditional “Talkin’ To Myself Again,” with an assist from The O’Kanes, peaked at #16. Both are very good although not memorable enough to stand out amongst iconic hits from the era. The remainder of the album finds Wynette assisted by a plethora of country’s finest. Gene Watson provides harmony on “Tempted” while Vince Gill, in one of his earliest solo performances, lends his signature falsetto to “I Wasn’t Meant to live my Life Alone.” Ricky Van Shelton, among others, helps liven up the proceedings with the jovial “A Slow Burning Fire.” The Gatlin Brothers are the perfect accompaniment to the title track, a song that feels tailored to their trademark style. Higher Ground, as a whole, is a gorgeous album. Wynette is still at her peak and the arrangements haven’t aged in the least. I would’ve liked songs that were more memorable, though, or even packed more of a punch. Despite her status as an icon, it’s easy to see how this album fell under the radar – her contemporaries were releasing stronger music that was easier to get noticed. But this is an album that shouldn’t be overlooked. It’s well worth checking out. After the underperformance of Love And Honor, Ricky left Columbia, but a move to independent label Vanguard in 1997 saw him making some of his best music. He was reunited with his old producer Steve Buckingham, assisted on this occasion by Marshall Morgan. The sensitive arrangements are laden with fiddle and steel, and put Ricky’s pure voice with its delicate vibrato at the center. It opens with the lively fiddle-led kissoff ‘Just Say Goodbye’, written by Byron Hill and Joe Chambers. It’s one of my favorite of Ricky’s up-tempo recordings. Chambers also contributed the impassioned ballad ‘I Wish You Were More Like Your Memory’, in which the protagonist can’t get over his ex. A cover of Mel Street’s classic cheating song ‘Borrowed Angel’ is also great. The title track is a lovely old Johnny Russell song about a relationship about to collapse, which was also recorded by a number of other artists, most recently the Trio of Dolly Parton, Linda Ronstadt and Emmylou Harris. ‘She Needs Me’ is a romantic ballad about an independent woman. ‘Tic Toc’ is a brightly delivered medium-paced number about a relationship about to wind down, with a protagonist who doesn’t sound too upset about it. The album loses steam as it tails off with the last three tracks. ‘Our Love’ and the optimistic ‘The Best Is Yet To Come’ (the album’s sole, non-charting, single) are pleasant but forgettable. Sandwiching the pair, the regretful ‘The Best Thing I Had Goin’’ is actually pretty good, but not as memorable as the bulk of the album. This album has been overlooked because it was released towards the end of Ricky’s career and as an exclusive Walmart offering, but it’s well worth tracking down used copies. RVS III appeared in January 1990, a little more than a year after Loving Proof. Like its predecessors, it was produced by Steve Buckingham and was a mixture of both new material and some carefully selected covers of older songs that were suddenly back in vogue during the New Traditionalist era. This time around, however, there was slightly less emphasis on rockabilly-style numbers on more on ballads which were proving to be Ricky’s strong point. Preceding the release of RVS III was a maginificent cover of “Statue of a Fool”, which had been a #1 hit for Jack Greene in 1969. Ricky’s version just missed the top spot, peaking at #2, but it remains one of the standout singles of his career and is his greatest moment of this album. The uptempo “I’ve Cried My Last Tear For You”, written by Tony King (who was engaged to Wynonna Judd at the time) and Chris Waters was the next single. This one did reach #1, but it’s not one of my favorites, which is a not a criticism of the song, but a testament to the strength of the rest of the album. Another great ballad “I Meant Every Word He Said”, in which the protagonist is forced to watch the woman he loves marry another man, also topped out at #2. The album’s fourth and final single was a cover of “Life’s Little Ups and Downs”. The blues-tinged track was an underperforming single for Charlie Rich in 1969. Ricky’s version reached #4, and although it provides a change of pace, it’s my least favorite track on the album. There are only two rocking numbers on RVS III – “Love Is Burnin'”, which is in the same vein as “Crime of Passion” and a cover of Roy Orbison’s “Oh, Pretty Woman”. The rest of the album was comprised of ballads, most of which could have been hit singles, but Columbia was likely reluctant to release too many ballads in a row to radio. Among these choice tracks are “You Would Do The Same For Me”, a Rory Bourke-Mike Reid composition that I would have preferred to see as a single in lieu of “Life’s Little Ups and Downs”, “I’m Starting Over” written by Kix Brooks with John Wesley Ryles and Mark Sherrill, and a fantastic version of Cindy Walker’s “Not That I Care”. This beautiful waltz had been a minor hit for Jerry Wallace in 1966 (peaking at #44) and had also been recorded by The Wilburn Brothers. Another standout is album’s closing track “Sweet Memories”, which had been an adult contemporary hit for Andy Williams in 1968 and covered by Willie Nelson in 1979. Ricky is joined by Brenda Lee, who was long past her commercial peak, but her voice was still strong and lovely and complemented his nicely. The track features a tasteful string arrangement which gives it a little more countrypolitan feel than the rest of the album. Despite a couple of weak spots, namely “Life’s Little Ups and Downs” and the self-penned and forgettable “I Still Love You”, RVS III is packed with top-drawer material and it quickly attained platinum status as its two predecessors have. However, by this time the formula of a few rockabilly numbers and a lot of ballads, a few old songs and a few new was starting to become predictable and may partially account for Shelton’s relatively brief reign at the top of the charts. Nevertheless, it is an album well worth listening to and I enthusastically recommend it. In the wake of his first two albums, Columbia Nashville persuaded Ricky Van Shelton, and his producer Steve Buckingham, to make a holiday album. 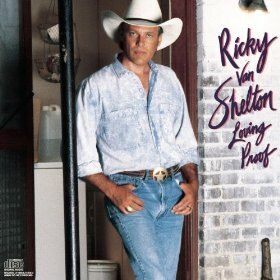 Ricky Van Shelton Sings Christmas was released in July 1989. It peaked at #32 on the country album’s chart. The album mixes standard Christmas songs with two covers and a couple of original tunes thrown in. “I’ll Be Home for Christmas” starts the album off string-heavy, with Shelton’s commanding voice cutting through the generic production beautifully. “White Christmas” is more of the same but with flourishes of piano thrown in. “Silver Bells,” one of my favorite Christmas songs, is too slow, suffering from a lack of tempo to make the track even somewhat interesting. Shelton does a masterful job, though, with “Silent Night.” By forgoing distracting and predictable strings, Buckingham showcases Shelton’s voice with light piano to back him up. The results are incredible, with Shelton conveying the standard perfectly. “Please Come Home for Christmas” shows off Shelton’s bluesy side, but the piano doesn’t work as well and comes off a bit cheesy and dated sounding. “What Child Is This?” just about returns Shelton to the atmospheric heights of “Silent Night” although the former number is just a bit more tastefully constructed. He turns up the tempo with “Santa Claus is Coming To Town” and the results are very good. The track could’ve been more original sounding, but what it suffers in imagination, it makes up with Shelton’s engaged vocal. His version of Eddy Arnold’s “C-H-R-I-S-T-M-A-S” is close to Arnold’s original as they both have very similar vocal tones. Shelton gives the track a slight uptick in tempo, which keeps the track from being too slow. Willie Nelson wrote the country Christmas standard “Pretty Paper,” which Shelton gives a straight reading complete with steel guitar. Hearing steel on a holiday album always strikes me as odd, but in this context it works perfectly. Also included are two original numbers, co-written by Don Schlitz and Shelton. “Country Christmas,” a western swing number, seems jarringly out of place on an album dominated by lush string ballads, but it works as a recording on its own. The arrangement makes the lyrics seem silly, but I do love how it sounds. “Christmas Long Ago” is the album’s most organic sounding number, complete with ribbons of dobro. Listening to the two Shelton co-written tracks, I wish he had gone and created a holiday album in that vein instead of including so many drearily produced standards. The quality of the material is excellent, I just wish it sounded better. Lush string sections on holiday recordings, no matter how prestigious the string section may be, are a cliché. Shelton did release a second holiday album, Blue Christmas, in 2005 that corrected many of the issues I had with this recording. None of this project is inherently bad, it’s just more bland than it needed to be. By 1989 Ricky Skaggs was no longer the hottest commodity in country music; the New Traditionalist movement had produced a lot of new and younger competition, and Ricky’s sales and radio airplay figures suffered as a result. However, he closed out the decade of his greatest commercial success with one of the finest albums of his career. For the first time, he worked with a co-producer — Steve Buckingham — perhaps in part because Ricky was busy producing Dolly Parton’s White Limozeen album at the same time. Dolly’s chart resurgence seems to have rubbed off on Ricky; shortly after her album dropped he scored a #1 hit with “Lovin’ Only Me”, his first chart topper since “Cajun Moon” three years earlier. It was also to be the last #1 hit of his career. However, he did reach the Top 5 one last time with Kentucky Thunder’s second single “Let It Be You”, an excellent ballad written by Kevin Welch and Harry Stinson. Skaggs was seemingly back in the good graces of country radio, but his renewed success proved to be only temporary. From this point on, none of his records cracked the Top 10. There were, however, three more singles released from Kentucky Thunder: “Heartbreak Hurricane”, which reached #13, “Hummingbird”, which peaked at #20, and the #25-charting “He Was On To Something (So He Made You).” All of them are quite good but my favorite of the three is the energetic “Hummingbird”, which had appeared a few years earlier on a Restless Heart album. One of that band’s more country sounding numbers, it was written by band member Greg Jennings with Tim DuBois. As far as the tracks that weren’t released as singles are concerned, the best are the grass-is-always-greener themed “The Fields of Home”, “Lonesome For You” (both written by Larry Cordle and Larry Shell), “Casting My Shadow In The Road”, and the ballad “When I Love”, which was written by Don Schlitz and Paul Overstreet, one of the hottest songwriting teams in country music at that time. Kentucky Thunder lacks the bluegrass flourishes of Ricky’s earlier work, but it is an excellent example of late-80s traditional country. It briefly reversed his decline on the singles chart, it did little to improve his sales figures. Its sole flaw is its brevity; it clocks in at just under 30 minutes, despite the inclusion of an atypical-for-the-era eleventh track (the spiritual “Saviour, Save Me From Myself”). It’s difficult to find, except at absurd prices, but presumably it will join Ricky’s other Epic albums in re-release on Skaggs Family Records. When it does, grab it; it’s well worth it. The duo’s sophomore album, released in 1988, continues largely in the same vein as their successful debut disc — combining elements of country and rock with tight harmonies that proved very popular with radio programmers and listeners. Like its predecessor, One Time, One Night was produced by Steve Buckingham, but co-producer Hank DeVito was nowhere to be found this time around. Janis Gill continued to hone her songwriting skills, contributing two compositions co-written with Don Schlitz and one with Gail Davies. Among the collaborations with Schlitz was the album’s lead single “Satisfy You”, an uptempo Cajun-flavored number that continued the Sweethearts’ string of Top 10 hits. It peaked at #5, as did the next single, “Blue to the Bone”, which allowed them to showcase some impressive harmony singing that was somewhat reminiscent of a female version of the Everly Brothers, whose “So Sad (To Watch Good Love Go Bad)” is covered here. The Sweethearts are joined by Vince Gill for what is, in my opinion, one of the very best versions of this song, aside from the 1960 original. It is one of the standout tracks on the album and one of my favorites. And when the clock strikes twelve, drink a toast to this old friend. And I don’t care if I never see midnight again. At the time I thought that, as the album’s fourth and final single, the record might not have received the same promotional push from the label as the earlier releases had. That is still a possibility, but the fact remains that it marked the end of the duo’s winning streak, and they would never chart inside the Top 20 again. Among the album cuts, “Gone Again”, the tune that Janis wrote with Gail Davies, is the most interesting. It talks about the whirlwind pace of life on the road and the personal sacrifices that come along with fortune and fame, something that the Sweethearts could likely very easily relate to at the time. “You Never Talk Sweet”, which is the other Gill/Schlitz song on the album, is also quite good. The album’s sole misstep is the Wally Wilson/Kevin Welch number “We Won’t Let That River Come Between Us”, which seems a bit forced and doesn’t quite work for me. The Sweethearts of the Rodeo did not enjoy a long run at the top of the charts. They released two more albums for Columbia, 1990’s Buffalo Zone and 1992’s lackluster Sisters. Neither produced any hits and they were dropped from the Columbia roster. One Time, One Night is the best of their four major-label releases. It is not available digitally, but inexpensive CD copies are easy to find. It’s worth seeking out, along with their debut disc. The stagename adopted by the Oliver sisters was a nod to the seminal Byrds album, and fittingly the music the duo produced in their hitmaking days was energetically sunny country rock rooted in their California background. The distinctive booming alto of Kristine Arnold takes the lead on all their work, supported by her older sister Janis Gill (then married to Vince). Their debut record on Columbia, halfway between an EP and a full length album with just eight tracks, was produced by Hank DeVito (who also plays steel guitar) and Steve Buckingham, and they produced a sound which was very radio friendly. The truncated length may have short-changed purchasers, but no less than five of the eight tracks were reasonably successful singles, getting their career off to a great start. Their effervescent and beaty debut single ‘Hey Doll Baby’ was a cover of an old R&B number previously recorded by the Everly Brothers, given a rockabilly style makeover. It just missed the top 20, but was a sign of better things to come, with an irresistibly catchy beat making up for unremarkable lyrics. Equally catchy, but a much better song, ‘Since I Found You’ was written by the not-yet-famous Foster & Lloyd. A bright mid-tempo love song about a one-time partier wanting to settle down for the first time now that the protagonist has met the right person, it gave them their first top 10 hit, reaching #7 on Billboard. In fact these two #4 hits were to prove their highest ever charting hits. Janis wrote ‘Gotta Get Away’, a pacy number about a woman afraid to let go and fall in love in case it works out badly. This is less memorable than their other singles, but is quite enjoyable and was another top 10 hit. The heartbroken ‘Everywhere I Turn’, which she wrote with Michael G Joyce, has a strong vocal from Kristine and is a pretty good song, but its rushed tempo detracts from the emotions and makes it feel like filler. ‘Chosen Few’, written by John Jarvis and Don Schlitz has a syncopated jerky rhythm which doesn’t really work for me. They finish up with the stark and stripped down ballad ‘I Can’t Resist’, written by DeVito with Rodney Crowell. This shows they had more to offer than country-rock, and also showcases Janis’s harmonies. This was a very promising debut by a duo with a distinctive sound, a little harder edged and less sentimental than their more successful rivals the Judds could be. Used copies of this are available very cheaply, and it’s worth checking out. Dolly Parton found herself without a record deal for the first time in 30 years when Decca Records closed its Nashville office in 1998. Throughout the decade, she had been losing ground with country radio, though her album sales had remained solid for much of that time. With the major label phase of her career now over, she decided that it was time to make a legacy record and partnered with Sugar Hill Records for a trilogy of critically acclaimed bluegrass albums. The first and best was 1999’s The Grass Is Blue, which is one of the finest — perhaps the finest — albums of her career.. Finally free of major-label constraints and commercial considerations, she finally made the bluegrass album she’d first talked about a decade earlier. With longtime producer Steve Buckingham once again on board, she assembled a who’s who list of bluegrass musicians, including Jerry Douglas, Sam Bush, Stuart Duncan, Bryan Sutton, Jim Mills and Barry Bales, and recorded a collection that included some bluegrass standards, grassed-up covers of other artists’ hits and four of her own original compositions. Alison Krauss, Dan Tyminski, Claire Lynch, Keith Little, Patty Loveless, Rhonda Vincent and Darrin Vincent all contributed harmony vocals to the project. The album opens with a spirited cover of Billy Joel’s “Travelin’ Prayer” that is so effective it is difficult to remember that it wasn’t originally conceived as a bluegrass song. It is followed by covers of The Louvin Brothers’ “Cash On The Barrelhead”, Hazel Dickens’ “A Few Old Memories”, and Lester Flatt’s “I’m Gonna Sleep With One Eye Open”. The best of the cover songs, however, is a beautiful rendition of Johnny Cash’s “I Still Miss Someone”, on which Alison Krauss and Dan Tyminski contribute harmony vocals. The four original Parton compositions are reminders of Dolly’s tremendous talent as a songwriter. “Steady As The Rain” and “Endless Stream Of Tears” sound like rediscoveries of previously forgotten long-lost gems, while “Will He Be Waiting For Me” has a slightly more contemporary feel. Dolly’s sister Stella had taken “Steady As The Rain” into the Top 40 in 1979, while “Will He Be Waiting For Me” was a remake of one of Dolly’s own album cuts from the early 70s. But the centerpiece of the album is the gorgeous title track, on which Dolly’s vocal performance and songwriting, as well as the musicians’ performances, shine. “The Grass Is Blue” is vintage Dolly that, with a slightly different arrangement, would have been equally at home on her albums from the early 70s or the 90s. The album closes with an acapella gospel number, “I Am Ready”, which was written by Dolly’s sister Rachel Dennison. Rhonda Vincent, Darrin Vincent and Louis Nunley provide the harmonies. Perhaps as an acknowledgement that there was little here to appeal to radio, no singles were released, but the album managed to reach #24 on the Billboard Top Country Albums chart and is credited with aiding the resurgence of the bluegrass genre in the early 2000s. It also earned Dolly a Grammy for Best Bluegrass Album, which, along with her induction into the Country Music Hall of Fame in 1999, allowed her to close out the millennium on a high note. More importantly, The Grass Is Blue, along with its successors Little Sparrow and Halos & Horns, helped to erase lingering memories of some of Dolly’s less than stellar efforts from the late 70s and early 80s, and went a long way towards restoring her credibility amongst those who still regarded her as a pop sellout. These three albums were to Dolly’s career what the American Recordings albums were to Johnny Cash’s – they reaffirmed that veteran artists who were past their hitmaking days could remain relevant, and that their finest work often comes after the mainstream has stopped paying attention. The Grass Is Blue is still easy to find on CD and in digital form from Amazon and iTunes. Throughout the 1980s, Dolly Parton continued with her pop-hubris sound, with her albums getting steadily worse as the decade progressed, finally culminating in 1987 with the alarmingly bad Rainbow. When that album – her first for Columbia Records – failed to produce a country top 40 hit, the singer switched directions with her next release. The Ricky Skaggs-produced White Limozeen was a return to form for Parton, back to a more contemporary country sound with no attempt at scoring crossover hits. The result was her first chart-toppers in 4 years and her best album in over a decade. In 1991, Dolly issued the follow-up to Limozeen with Eagle When She Flies. It would earn her another country #1 single and would be her first #1 album since 1980’s 9 to 5 and Other Odd Jobs, and become only her second platinum set. The material and production – this time provided by Steve Buckingham and Gary Smith – followed the sounds of White Limozeen and propelled Parton into the forefront of the booming country scene of the early ’90s, if only for a little while. Leading off the album at radio was the duet with Ricky Van Shelton. It was written by Dolly’s brother Floyd, and is one of three tracks here she didn’t have a hand in writing. “Rockin’ Years” is a stone country love song that finds the pair trading promises of forever to one another. The memorable waltzing chorus and sweet sentiment sent it sailing to the top of the country singles chart. Parton delivers one of her best full-voiced performances alongside Shelton’s smooth baritone. Given Parton’s renewed favor at radio, it’s a bit perplexing that “Silver and Gold”, an uncompromising gospel song, was shipped to radio next. Parton convincingly sings of meeting a ragged old man, presumably an earthly incarnation of Jesus, who reminds her the greatest things in life don’t cost a thing, and more importantly, to prepare yourself for the eternal kingdom of God. From Parton’s trademark whispering vocals in the last verse to the simple and attractive melody, it sounds like a Parton original, but actually comes from the songwriting team of Gregg, Stan, and Carl Perkins. Getting a song like it to a respectable #15 in 1991 was a testament in itself. Next at radio, and likely the final nail in Parton’s radio airplay coffin, was the title track. Good a song as it is, I have to wonder why nobody doubted the song’s commercial appeal. Behind the song’s remarkable lyric is an anthemic production, beginning softly at first and building into Parton singing with no less than a full choir and an orchestra by the end. It’s no surprise to me that it only went to #33. Had the final single impacted radio first, and cemented Parton’s hit-making status, it may have fared better. But we’ll never know. The last single was “Country Road”, a jaunty contemporary number, where the singer implores the town’s highfalutin ladies man to check out the country girl. It’s a favorite for me with the breezy melody laced with steel guitar flourishes, and a memorable lead guitar track. Plus it’s one of Parton’s best performances here. I’ve always felt this album was overlooked because of its place near the end of the hit-making stage of Parton’s storied catalog, but mostly because the wrong singles were sent to radio. Certainly others could have hit with larger audiences. The opening track “If You Need Me”, is a fun grassroots barn burner that serves as a goodbye letter to an unreliable man. Lorrie Morgan joins in for the bluesy female confrontational that is “Best Woman Wins”. Likewise enjoyable are the somewhat power ballad “What A Heartache”, which features sparse piano-led verses and another winning full-voiced vocal from Parton, and the similarly arranged take on what we all do, and put up with, and get from our “Family”. When it was released, Eagles When She Flies found Dolly Parton once again standing front and center with modern mainstream country music. She takes the listener from contemporary country to bluesy numbers and whispery gospel to full-voiced power ballads, all with satisfying results. Its commercial success notwithstanding, this is Parton’s finest collection yet, save for compilations. Columbia Records’ strategy to market Mary Chapin Carpenter as a country artist is said to have begun with the release of her breakthrough sophomore album State of the Heart (reviewed by Meg last year as part of our Class of ’89 coverage). Prior to that her music was more heavily influenced by folk than country; her 1987 debut album Hometown Girl is a good example of the type of music she was making before she found her commercial niche. I can’t help wondering who the intended audience was for this album. In its original, independent-release incarnation, I imagine that this was more of a straight folk album. It was re-recorded when Mary landed her deal with Columbia, and producer Steve Buckingham — known for his work with Dolly Parton, Ricky Van Shelton, and Tammy Wynette, among others — was brought in as a co-producer, in order to make the album more commercially appealing. It’s odd that a Nashville producer would be brought aboard before the decision was made to market Mary as a country artist, and stranger yet, that once his commercial flourishes were add to the album, Columbia declined to release any singles and seems to have made little or no attempt to promote Mary to country radio. Since I’m not a huge Mary Chapin Carpenter fan, I didn’t buy this album when it was first released. Like most people, I didn’t even become aware of her until State of the Heart was released. As a result, I listened to the album for the first time when I was preparing to write this review, which gives me a different perspective than if I were looking back at an album that I’d been listening to for over twenty years. My first impression was that while Hometown Girl is not Mary’s very best work, it is vastly superior to the majority of the overproduced music coming out of Nashville today. Even at this early stage in her career, Mary’s talent as a songwriter is readily apparent. She was the sole writer on seven of the album’s ten songs, and was a co-writer with John Jennings (who co-produced the album with Buckingham) on an eighth song. Her skill in writing literate lyrics is reminiscent of fellow folkie Nanci Griffith, who was making her own attempt to find mainstream commercial success on a major Nashville label around the same time that Hometown Girl was released.